Sememi Community Health Center is located in two areas of the former red district of Kandangan and Sememi, and they were officially closed in December 2013. The closure of these would have a major impact on the surrounding community. Impacts that arise in health sector would include the transmission of sexually transmitted infections (STIs) and HIV-AIDS. Thus, Sememi Public Health Centre held a program that aims to control STI and HIV-AIDS and improve the assistance and treatment of STI and HIV-AIDS patients. HIV is a virus that attacks the immune system. During the infection, the immune system becomes weak. People living with HIV (PLHIV) become more susceptible to infection and could show symptoms of opportunistic infections. Observational research was conducted in the work area Sememi Puskesmas with the observation of health centers and secondary data collection. From these activities, researchers obtained low results on the visit of PLHIV-AIDS to the dentist with 12.5%. Therefore, it would be difficult to detect the problem of teeth and mouth in PLHIV. In the results of epidemiological studies conducted at the Sememi Public Health Centre, it showed that there was an increase in the severity of caries in PLHIV. Caries could be occurred and affected by several risk factors, including the level of education, age, socioeconomic, knowledge on caries, knowledge on HIV, attitudes to caries, maintaining oral hygiene, and frequency visiting the dentists. Based on the result, researchers devised an empowerment program to overcome the high problems of caries severity in PLHIV. Empowerment program is conducted in group approaching method and counseling using visual media (book) and audiovisual (video). The aim of this program is to enhance willingness and ability to maintain and improve dental health. This research was conducted in a month, in the area of Sememi Urban Village, Surabaya. The sampling used the total sampling of 16 PLHIV/AIDS were taken from the entire new HIV/AIDS-assisted group in the area of the Sememi Public Health Center in 2017 based on the previous epidemiology research. As a basis for empowerment implementation, an observational research with cross-sectional approach is used for measuring decayed, missed, and filled teeth (DMFT) and saliva flow rate to know caries status in PLHIV. The instrument used in determining the risk factors in this study is the questionnaire that has been consulted with the expert. Furthermore, observational research results are discussed through Focus Group Discussion (FGD) with relevant stakeholders, to determine priority issues and empowerment planning. All the procedures done in this empowerment have been approved by the Village leader, Head of Public Health Center, and Department of Health Surabaya. All the respondents who were the subject in this study had filled the informed consent that stated their willingness for intraoral examination and filling questionnaire. Ethics approval for performing this study has been obtained from the Research Ethics Committee of Faculty of Dentistry Universitas Airlangga, with the number of ethic clearance is 201/KKEPK. FKG/IX/2016. This research is approved by Head of Public Health Center in Surabaya, East Java Province, and running with Head of Town approval. The findings were intervened through several methods of empowerment, group approaching method and using supporting media in the form of books and audiovisual. The intervention targets consisted of primary groups (PLHIV-assisted groups) and secondary (visitors of Puskesmas and junior high school students) as supportive of promotive and preventive efforts. The success of empowerment is evaluated based on the pretest and posttest score after the intervention. [Table 1] showed that most of the beneficiary group of PLHIV were men over 35 years old, with average level of education was higher than high school. In [Table 2], it was found that the respondent group's group had a very high of DMFT caries score with 7.75%. 81.25% of respondents had low flow rate. 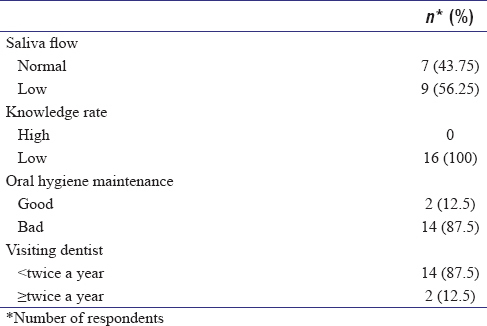 Based on the questionnaire results, the risk factors that influence the caries status of the respondents are the low level of knowledge, oral hygiene maintenance, and the lack of respondent visit to the dentist within 1 year. These issues formed the idea for the implementation of the empowerment intervention. The level of knowledge and maintenance of oral hygiene target before and after intervention could be seen in [Table 3]. From the results obtained before the intervention, the average score of respondents who have the level of knowledge and maintenance a good oral hygiene was 55.33%, and after intervention, it increased to 86.67%. From this improvement, successful implementation of satisfactory empowerment interventions has been fulfilled as a success indicator. Based on the results of the interventions, there was an increase in knowledge and maintenance of oral hygiene in each target. Before the intervention, the level of knowledge and maintenance of oral hygiene averaged was 55.33%. The low level of knowledge before the intervention could be due to the lack of information about caries and oral hygiene maintenance actions which only in single direction; television, leaflets, and posters in health services. Thus, the respondents only knew a little information without fully understanding caries and how to maintain a proper oral hygiene action. After the intervention, the level of knowledge and maintenance actions of oral hygiene increased to 86.67%. This might occur since the intervention is conducted using a direct counseling methods. It provided an opportunity for participants to gain full knowledge and understanding because the delivery of information used interactively (two-way method). Thus, respondents could ask directly if the information was not fully understood. The increased knowledge was also supported by the media in delivering the material in the form of books, videos, and gymnastics of dental health. According to Levie and dan Lentz, visual media could facilitate the achievement of goals to understand and recall information or messages contained in the picture, while the media containing audio, according to Sumar (2016), could stimulate the process of thoughts, feelings, attention, and respondents ability in absorbing the material. A learner who receives material in forms of verbal and pictorial static such as photographs or illustrations and dynamic content such as video or animation films. Their encouraging ability can be enhanced by the addition of visual forms of presentation. The more the senses are used, the more clearly the comprehension or knowledge gained. According to research experts, the fusion channel information through the eyes 75% and 13% through the ears will provide a good enough stimulus to provide optimal results. The high caries status in PLHIV in the working area of Sememi Surabaya Community Health Center is caused by several factors including low knowledge of caries and poor oral hygiene maintenance. This level of knowledge includes the causes of caries, the process of caries, the ways in which caries prevention, the effects of untreated caries, and the caries influence to HIV/AIDS, while oral hygiene maintenance includes the time and manner of toothbrushing practiced using phantom. In addition, there are other risk factors that affect the high caries status in PLHIV-assisted group, such as low visits to the dentist; it is related to the low level of knowledge of the respondents. A low level of knowledge could affect the awareness of dental and oral health conditions which further affects low visits to the dentist. Furthermore, there are other risk factors derived from observational research results but not intervened on the stakeholder's considerations during the FGD, such as low-income level. In developing country, health promotion can be conducted by making empowerment programs, also to improve the social quality of life, not just giving them dental health materials. To arrange the program, it will need to adopt a systematic approach to planning. Based on the risk factors found, intervention is conducted through several approaches; group approaching method and using supporting media in the form of books and audiovisual. The group approach method was carried out through training of health agent of HIV/AIDS-assisted groups (K3DS). K3DS members were trained with caries knowledge and oral hygiene care including proper toothbrushing methods for subsequent delivery to other members of the HIV/AIDS-assisted group. As a media to support the delivery of information about caries and its influence to HIV/AIDS and as a proper oral hygiene maintenance, the book entitled Healthy Dental Book (BMGS) and communicative video about dental caries and dental gymnastic were aimed to increase knowledge about how to brush teeth properly. Health report card and communicative videos on dental caries were not only aimed to PLHIV, but also the Public Health Centre visitors as secondary target of interventions. Preventive efforts were carried out as early as possible to introduce HIV and its influence to dental caries in junior high school students in the work area of Sememi Public Health Center, Surabaya. The purpose of the socialization was not only to educate the public but also to motivate the public to carry out information that has been received regarding their own health, in the case of maintaining oral hygiene. Knowledge is an important aspect in shaping one's actions. Counseling is needed to improve peoples' knowledge, also expected to increase community participation in its implementation. The whole empowerment program was conducted successfully and obtained good results in increasing respondents knowledge and skills to maintain oral health. They also have been able to explain and practice how to brush teeth properly and correctly after the interventive programs. The authors would like to thank the Department of Dental Public Health, Faculty of Dentistry, Universitas Airlangga. Sememi P. Kerangka Acuan Kegiatan Program HIV/AIDS. Surabaya: Puskesmas Sememi Surabaya; 2015. Thomas S, Rahayu A, Alamudi MY, Hiv S, Thomas S, Rahayu A, et al. HIV screening in adolescents in Surabaya using a rapid test. Med Health Sci J 2017;1:57-62. Maulana HD. Health Promotions. Jakarta: EGC; 2009. p. 12-3. Republic of Indonesia Ministry of Health. Health Promotion Center, Guidelines for Management of Health Promotion, in Achieving PHBS. Jakarta; 2008. Widyawati. Effect of Health Education on Knowledge and Attitudes of Elementary School Students in the Prevention of Dengue Hemorrhagic Fever in Medan Denai District. Medan: University of North Sumatra. Thing; 2010. p. 12-4. Levie WH, dan Lentz R. Effect of text illustration: A review of research. Educ Commun Technol J 1982;30:195-232. Sumar WT, Razak IA. Learning Strategies in Implementing Curriculum Based on Soft Skills. Sleman: Deepublish; 2016. Alhayek AI, Alsulaiman MJ, Almuhanna HA, Alslem MA, Althaqib MA, Alyousef AA, et al. The effect of conventional oral health education versus animation presentation on the perception of Saudi males in primary school children. J Int Oral Health 2018;10:121-6. Gunawan F. List of Educational, Legal and Economic Research in Southeast Sulawesi. Sleman: Deepublisher; 2018. Richard ME, Moreno R. Animation as an aid to multimedia learning. Educ Psycol Rev 2002;14:87-99.